TWENTY PEOPLE WERE taken ill due to noxious fumes in the kitchens of the EU’s new Europa building in Brussels today, but officials insisted a summit of the bloc’s leaders at the venue next week will go ahead as planned. 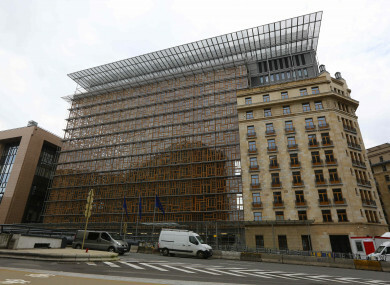 The €321 million headquarters of the European Council were evacuated and ambulances rushed to the building, dubbed the “Space Egg” because of its futuristic oval interior shape. “There was a bad mix of chemical products on the kitchen level. That caused fumes,” Pierre Meys, a spokesman for Brussels emergency services, told AFP. He said the symptoms included “sore eyes and vomiting”. A European Council spokesman told AFP that 20 people were taken ill. Nine people were hospitalised and five were later released. “We continue to monitor closely the medical condition of the four contractual staff who remain under observation in hospital,” the council said in a statement. The EU said that emergency services had “determined that the problem was caused by a chemical reaction between two industrial cleaning products” in the kitchen ventilator system. “We expect to re-open the Europa building on Monday. Meetings will resume as scheduled and our plans for next week’s European Council meeting remain unchanged,” the statement said. The summit of 28 European Union leaders, which will have Brexit and the future of Europe on the menu, is scheduled for 19 and 20 October. Staff from the Europa building were evacuated to the neighbouring Justus Lipsius building “applying the principle of safety first”, the council added. Meys said ambulances were deployed as part of an “emergency medical plan” created by local authorities for any incident involving more than 10 people. The Europa building opened in January after a series of delays. It was commissioned in 2004 with a projected cost of €240 million but ended up costing €321 million in what officials said was a “small over-run”. Designed by Belgian architect Philippe Samyn, it features a curved glass lantern-shaped structure inside a giant cube made of 3,750 recycled window frames sourced from across the 28-nation bloc. Email “20 people taken ill due to noxious fumes at venue for next week's EU leaders summit”. Feedback on “20 people taken ill due to noxious fumes at venue for next week's EU leaders summit”.